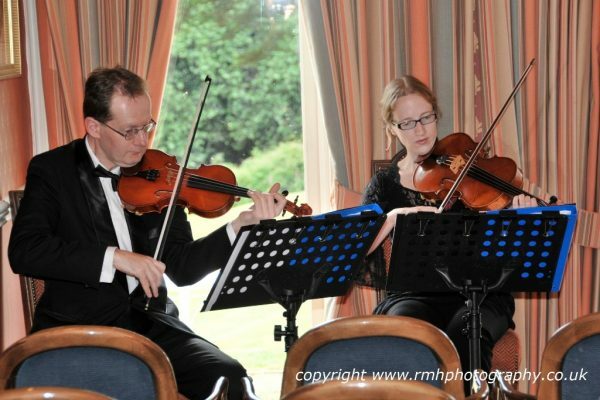 On Saturday 9th May our Buckinghamshire string duo (consisting of a violin and viola) played for an exuberant wedding that took place at The Kings Hotel in Stokenchurch (near to High Wycombe) in Buckinghamshire. We set up at the front of the ceremony room and it wasn‚Äôt long before all the guests entered and made their way to their seats. Everyone¬†seemed to be buzzing with anticipation (and possibly a drink or two!) before the entrance of the bride and we provided some well-known modern popular music in order to complement the atmosphere. The registrar announced the bride and for her processional we played Eva Cassidy‚Äôs touching rendition of ‚ÄòSongbird‚Äô for strings.¬† Our next opportunity to play came during the signing of the register and for this the bride had chosen Seal‚Äôs ‚ÄòKiss From a Rose‚Äô as well as Ben E King‚Äôs ‚ÄòStand By Me‚Äô. The happy couple then exited the ceremony to ‚ÄòSweet Dreams‚Äô by Eurythmics. During the drinks reception about ten of the guests spontaneously linked arms and sang along at the top of their voices to a number of pop and rock tunes we played. At one point the married couple joined in, before being called out for photographs. It wasn‚Äôt long before I passed our folder of music around so that guests could choose their own favourite songs to sing along to. It was a terrific atmosphere and we eventually ended our set to handshakes and applause as guests made their way into the wedding breakfast. Although for many weddings we’ll play to a carefully selected list of music, chosen in advance by the bridal couple, in this instance spontaneity took over and the result was a joyous occasion!